Like, Follow, Tweet, Post, Engage & Connect. Facebook is a free social networking website that allows registered users to create profiles, upload photos and video, send messages and keep in touch. For The Brisbane Golf Club it provides a cost effective way for two way communication with our members. We’d love our members to ‘Like’ our page and if you’re unsure we can show you how. 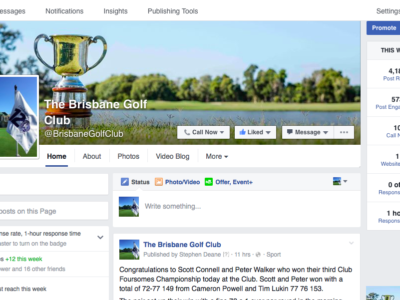 Find us by typing “The Brisbane Golf Club” into the Facebook search bar. Instagram allows you take a photo and share it will everyone around the world or just with selected followers. We love members sharing their golfing photos. We always also ask our newlyweds to put their favorite photos up. That way we can show our upcoming brides just how stunning our weddings are. Our username is brisbanegolfclub. On the home page you will notice a a twitter feed has been added and this will be used to communicate important messages to members from time to time. To follow us on Twitter simply type “thebrisbanegolf” into the Twitter search bar. Then click follow. 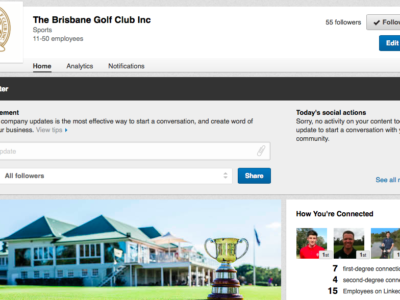 You can also start following The Brisbane Golf Club on LinkedIn and share and like our content. To follow us simply type “The Brisbane Golf Club Inc” into the LinkedIn search bar and then click the + Follow button. Would you like some help with your social media? Our social media it critical to our success and we would love to have as many of our members as possible using it with us. If you would like some help with social media, fill in the below enquiry form and we’ll organise a time to get you set up and started. Enter the above characters to confirm you are a genuine visitor and to prevent automated spam submissions.